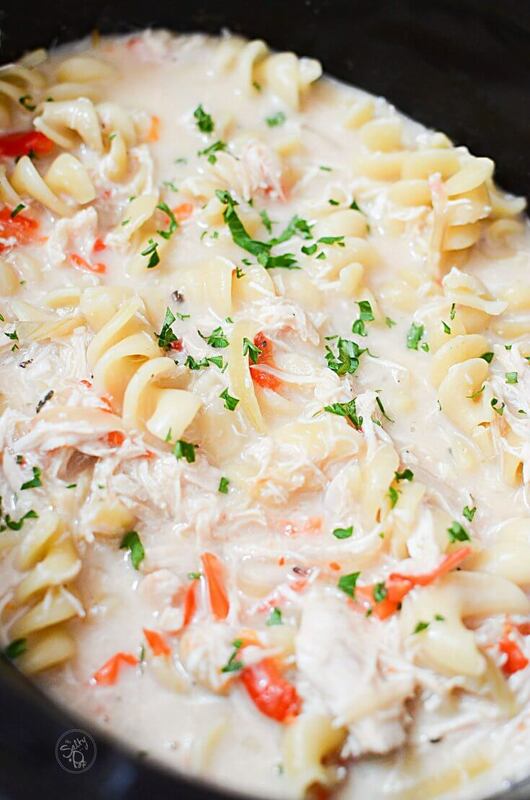 Hold onto your hats folks; we are in for a tasty ride with this slow cooker chicken alfredo soup! I am not even kidding when I tell you that when this savory soup hits your tongue, you are going to be head over heels in love. If you appreciate an easy meal that gives you a big bang in flavor, then you have to stick with me on this one. 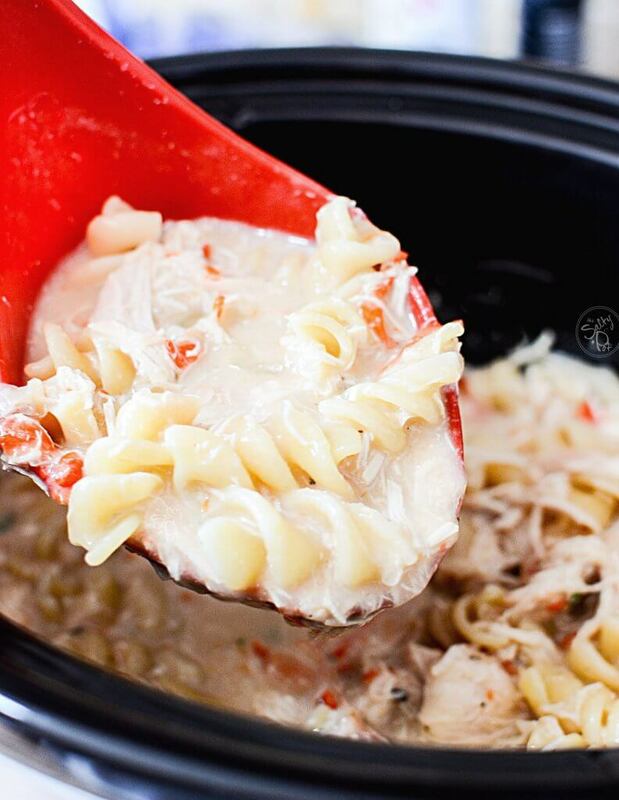 Every bite is filled with tender chicken, red peppers, strips of fresh onion, creamy alfredo sauce, and soft comforting rotini pasta. Other than cutting some vegetables, there is no prep work needed! I love recipes that I don’t have to give my constant attention to. Simplicity is always my goal, and this one is a winner that makes terrific leftovers too. Growing up, I have always gotten a hankering for chicken alfredo. The thought of turning one of my ultimate favorite dishes into a soup thrilled me to no end! Soup is one of those things that I crave even when it is hot outside. Some people eat it only in the winter, but I am not one of those. There’s just so many different variations of soup, and it’s sooo incredibly yummy, and I am confident you will agree with me. Pasta – If you don’t have rotini on hand, you can also use penne, tortellini or anything else that you like. There really isn’t a way to go wrong here, so you can do whatever you want. 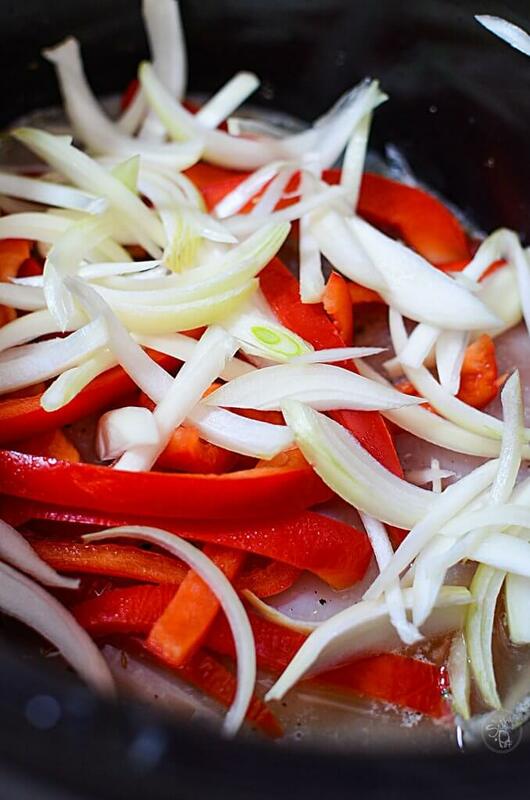 Garlic – Add in some minced garlic when you begin cooking the chicken, onions, and peppers. Can you ever have too much garlic? Broccoli – If you are a broccoli fanatic, throw some in when you begin cooking the pasta to add some extra greens. Cheese – Add some extra cheese right before serving. Shaved parmesan and mozzarella are my go-to cheese ideas for this dish. Use any kind you like! How Do I Store Leftover Easy Chicken Alfredo Soup? I doubt you will have any leftovers because it is so amazing, but if you do have leftovers, you can certainly save them. One huge plus of this soup is that it tastes better the next day because the juices and seasonings have had even more time to marry together. Place leftover soup in the fridge, and it will keep up to 3-5 days. The longer it sits, the pasta noodles will begin to break down so the texture may be a little more “stew’ like.. but it’s still super delicious! You can also freeze leftovers for up to 6 months too. Can I Make Chicken Alfredo Soup On The Stovetop? 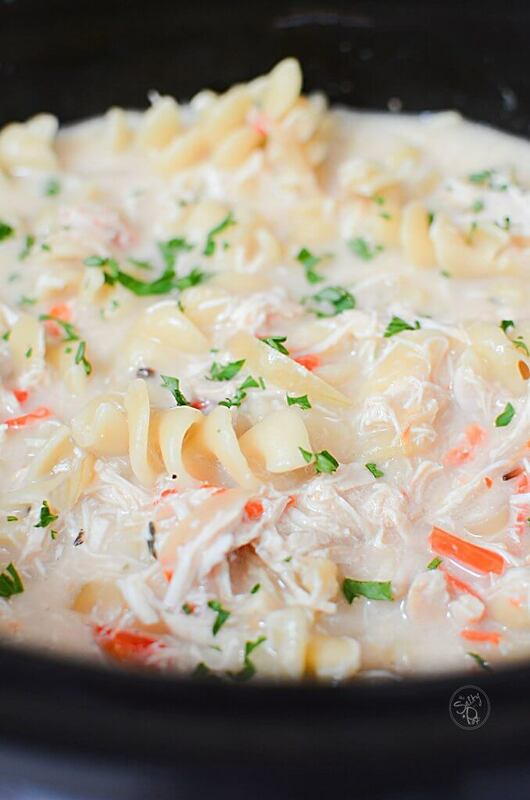 Yes, you can certainly make this chicken alfredo soup on the stovetop! The only reason why I don’t is that it is higher maintenance. 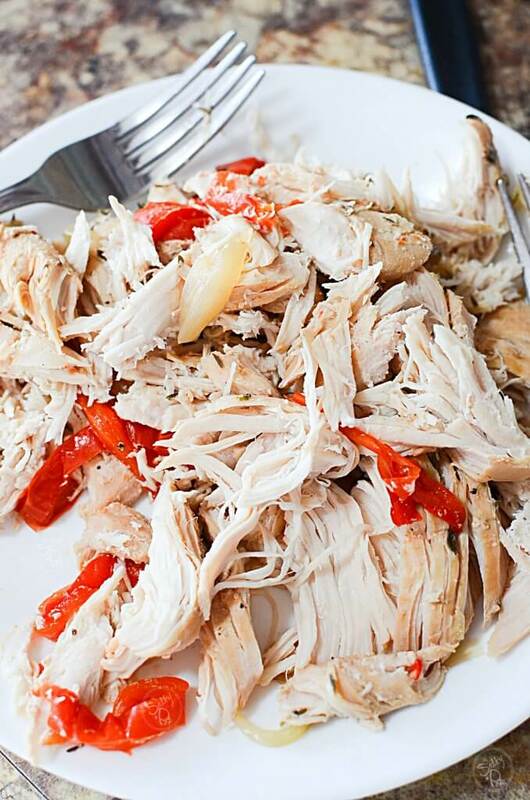 With the slow cooker, you can basically set it and forget it until it is time to shred the chicken. On the stovetop, you will need to keep a close watch to make sure it doesn’t burn or stick to the bottom of the pan. I recommend cooking it nice and slow instead of rushing it. Do I Have To Use Chicken In This Alfredo Soup Recipe? No, you don’t have to use chicken. You can omit it entirely or replace it with something else. If you decide to leave the chicken out altogether, I would add in extra vegetables, so it is hearty and not thin in terms of soup. Otherwise, you could add in crab meat, shrimp, or whatever you have on hand. The base of this soup is scrumptious, so you can’t go wrong with anything you add in. What Do I Serve With Slow Cooker Chicken Alfredo Soup? Bread – Dinner rolls, garlic bread, breadsticks, or anything else that fits your fancy. Try these Garlic Butter Bacon Cheddar Wheels, and you will feel like you went to food heaven. Salad – Make a Caesar salad or garden salad to go with it. So good! Asparagus – Roast or grill some asparagus. It goes really good with the sauce in the soup! I think you’ll see when you look at the directions, how super easy it is to make this twist on chicken alfredo recipe. Those creamy rich flavorful bites from the alfredo sauce, the chicken is tender as is the pasta, and the slight crunch from the peppers.. wow.. it’s pretty awesome if I say so myself 🙂 I’ve passed this recipe to a few other friends who’ve made it and now put it in their meal rotation!! 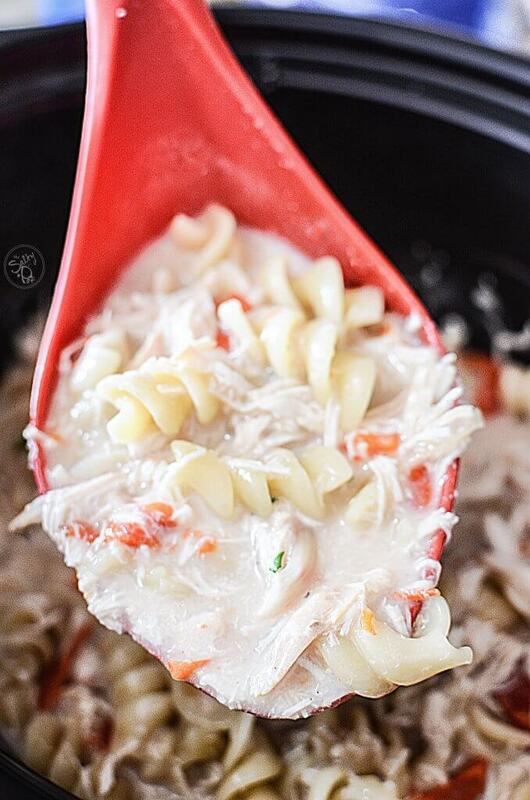 If you make this Slow Cooker Chicken Alfredo Soup, and change it up to suit your own tastes, please let me know about it! 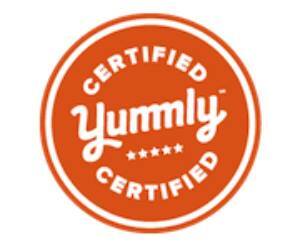 I LOVE hearing about the twists you guys make on my recipes!! Thanks so much for stopping by The Salty Pot today, and I hope you have a wonderful day!! 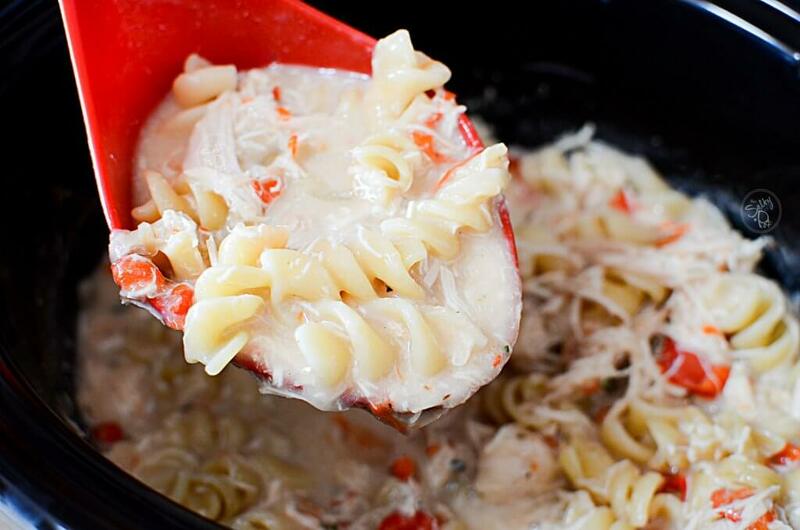 This creamy slow cooker chicken alfredo soup with pasta is the epitome of comfort food! So easy to put together, it's seriously one of those recipes where you get a huge flavor bang for your buck! 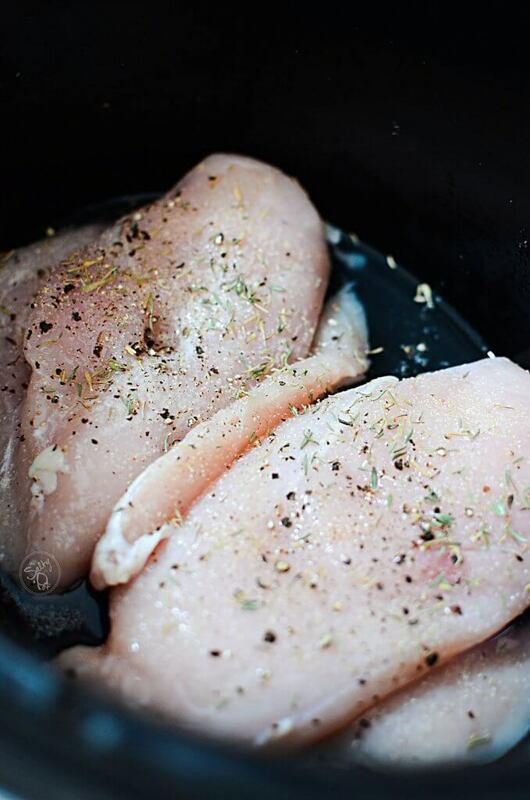 Season chicken breasts with salt and pepper and place into the bottom of the slow cooker pot. Add the pepper and onion strips and add the minced garlic. Cook on low for 5 - 6 hours, or high for 4 -5 hours. 1/2 hour before cooking time is done, remove the chicken breasts and shred them with two forks. 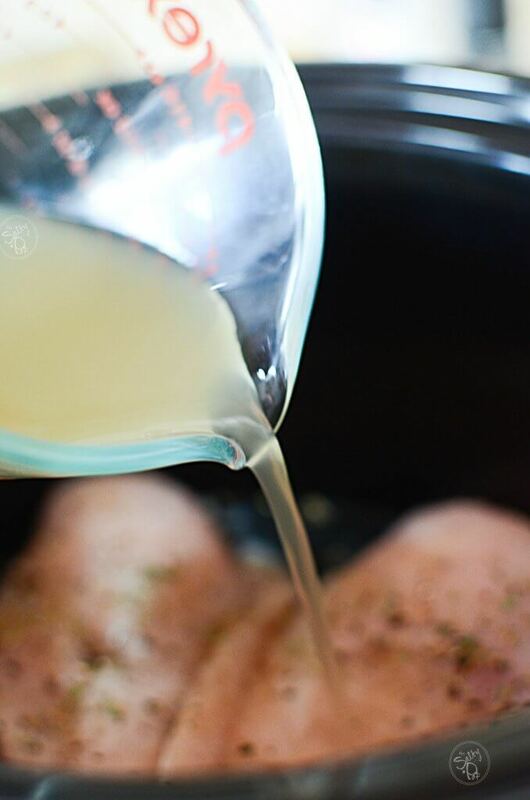 Add the chicken back to the slow cooker bowl, and add the rest of the chicken broth as well as the alfredo sauce. Add the pasta and mix everything well. Cook another half hour on high to mix the flavors and cook the pasta.